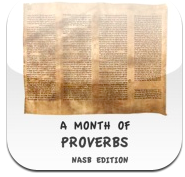 The “Month of Proverbs NASB Edition Free”iPhone, iPad or iPod Touch application lets you read the Proverbs in the NASB translation over one month. As with the similar Psalms application, it is very simple to use. The book of Proverbs is split into 31 days, you then just go through them day by day. There is not much more to add, as it is a simple application – but its strength is that it is the bible!